3 ft. 9-inch Right Drain Walk-In Whirlpool and Air Bathtub in White Walk-In's provide a safe and independent bathing experience. Using the latest in tub crafting techniques and industrial grade materials Walk-In Tubs offer an impressive line to meet your specific needs. Walk-In Tubs offer the satisfaction and peace of mind needed to truly enjoy a luxurious soak or a vibrant, soothing experience. 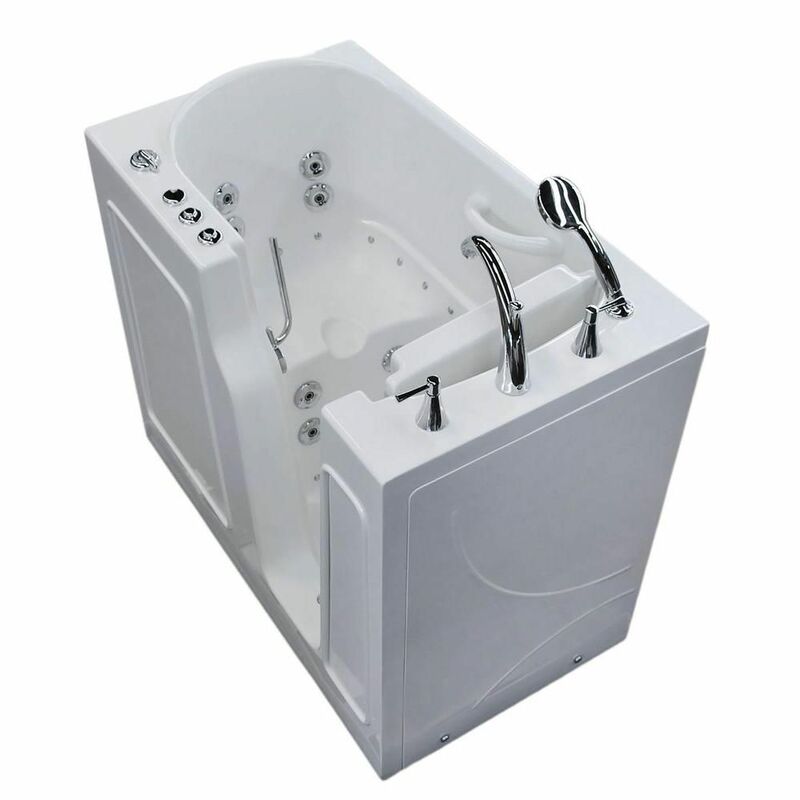 3 ft. 9-inch Right Drain Walk-In Whirlpool and Air Bathtub in White is rated 4.0 out of 5 by 5. Rated 4 out of 5 by Leida from Easy access and exit. Love the jets !... Easy access and exit. Love the jets ! Rated 5 out of 5 by Linda from Excellent product! Very safe for all ages, the fast fill... Excellent product! Very safe for all ages, the fast fill and drain are great! I highly recommend the tub!! Rated 2 out of 5 by cleaninmichigan from Home Depot 3.9 Ft Walk-In Tub Falsely Advertised - air pump is NOT variablle speed. It is HIGH / OFF only and so violent it blows water out of the tub. So violent it is not comfortable to use. Also advertised "ALL AIR PUMPS HAVE..." there is no air line purge system even thou it is clearly stated that ALL air pumps have this needed purge system. Contact with Universal Tubs in Miami & was told "OH....These are all options" but failed to show me where these phantom options are offered. BUYER BEWARE , you dont get what you have paid for. Installation is pushing $2000 after you have paid for a plumber (4-5 hours), a carpenter and an electrician (dedicated electrical line with GFIC installed is necessary). A lot of surprises are waiting for you when you go this route. Rated 4 out of 5 by BIG from Very well made tub for a small person. The tub was shipped to the local Home Depot and it was on a pallet and covered with a cardboard topper. It looked like it was shipped by the post office, the cardboard was torn and almost twisted off the pallet. I took lots of pictures but amazingly it was not damaged. I'm a male that's 6' and 230 lbs, so this tub seems really small. Without a surround this will make a huge mess taking a bath, but its really nice to set in with the air jets and water jets. I looked at all the other tubs that cost three times as much and all these local manufacturers said the Home Depot tubs are import junk. I could buy 3 of these for one of theirs. I didn't see anything to convince me into paying that much more for a TUB. However, buy the biggest one available and have a plumber install it. Forget the aromatherapy and the stupid light, not worth the money. Oh yeah, I had a couple of missing parts and they shipped them directly to me and guess what, it was made in Miami, Fl.